This Saving A Life Sign is 18" x 24" and constructed of heavy duty plastic. It has pre-punched holes for easy hanging and features U.V. resistant ink. 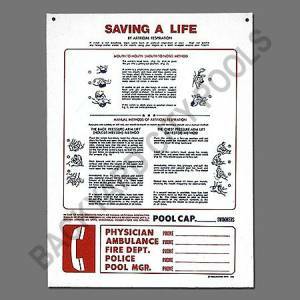 It features colorful graphics and instructions for performing Rescue Breathing and CPR, First Aid for choking and provides a spot for writing in Emergency contact information.